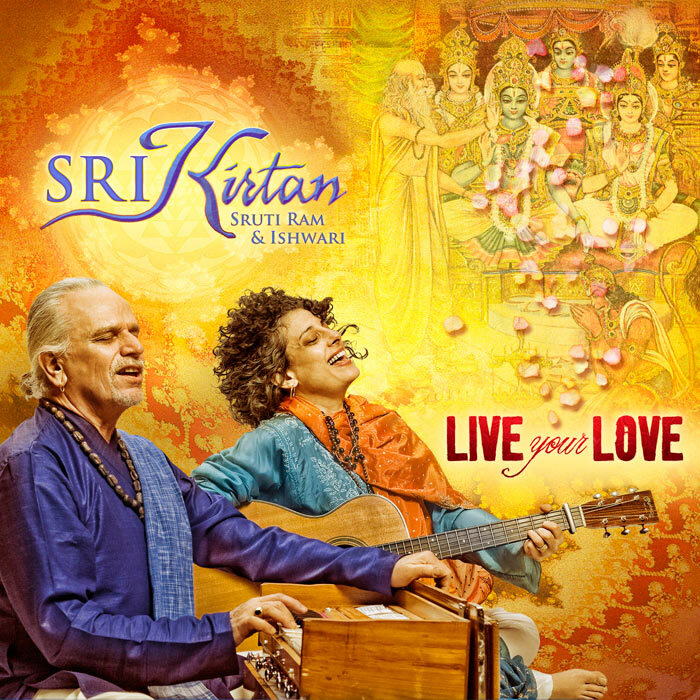 Live Your Love by SRI Kirtan opens the joys of kirtan and chanting to the world. Esthetically captivating and spiritually uplifting Live Your Love features a mixture of Sanskrit and English lyrics sung in non-traditional tunes. “I had traveled through the musical world, from folk to punk then opera to electronica and finally here to world spiritual music,” says Ishwari, SRI Kirtan band member. “It’s a dream to join forces with Sruti Ram who comes with 40 years of kirtan leading experience aside from his background in Gregorian chant, opera and doo-wop.” This unbelievable duo create an explosive fusion of ancient chants mixed with folk/gospel/hip hop creating some of the catchiest tunes ever heard in the kirtan/chant scene. Coming from Woodstock, NY the epicenter of the “Bhajan Belt” SRI Kirtan have been a community force and magnet for kirtan. “Our idea was to create musically diverse yet fantastically joyous and approachable chants. The whole point of kirtan is to join in the bhav or divine mood and sing along with others,” says Sruti Ram. “I feel that we have accomplished this and more with this album.” There’s no doubt about it, Live Your Love is sure to set a milestone in the kirtan/chant scene. “We gave it all our creatively and technically, our full effort, and then some,” says Ishwari. Released through Mantralogy via WEA/ADA (Warner Brothers) distribution, Live Your Love is available in stores, online and directly from Mantralogy. SRI Kirtan will be stopping at the major kirtan/chant festivals such as Omega Ecstatic Chant, The Bhakti Fest as well as East Coast and West Coast tours including Hawaii in promotion of Live Your Love. If you haven’t experienced SRI Kirtan before, you will most definitely want to. If you have already, you know you will be back for more.